Kitchen Window: Party Like The Swedes On Summer Solstice The Swedish summer solstice celebration of midsommar essentially comes down to three things: friends, food and schnapps. An American homage includes traditional dishes, plus a twist on the strong drink Scandinavians toss back to toast the season. Get recipes for Tosca Cake, Dilled Potatoes With Smoked Salmon And Horseradish Sauce, The Scandopolitan, and Swedish-Style Shrimp Salad. Adopting someone else's holidays can be an uphill battle. You can smile politely and appreciate from a distance, but deep down you're struggling to understand unfamiliar songs, customs and family traditions. Deep down, it's hard to make a new holiday really feel like your own. Unless that holiday is midsommar. Swedish midsommar essentially comes down to three things: friends, food and schnapps. Midsommar, the Swedish celebration of summer solstice, is a pretty easy holiday to love — perhaps because it's more of a party than a holiday. This year, the solstice itself falls on June 21. Swedes, like many in Europe, have celebrated the longest day of the year since pagan times. And with good reason: In a northern land where the sun barely rises during the dark, snowy winter, summer is a time to celebrate the golden outdoors. It's a time to sing and dance (ideally around a flower-studded maypole or frighteningly large bonfire), eat the best of the summer crops, and toss back shots of bracingly strong alcohol. Deena Prichep is a Portland, Ore.-based freelance print and radio journalist. Her stories on topics ranging from urban agriculture to gefilte fish have appeared on The Splendid Table, Morning Edition, All Things Considered, Marketplace, Voice of America, The Environment Report, Salon.com, The Northwest News Network and Culinate.com and in The Oregonian and Portland Monthly. She chronicles her cooking experiments at Mostly Foodstuffs. Here in Portland, Ore., we know what it's like to suffer through endless winter (true, ours is gray and soggy versus dark and snowy, but the oh-where-did-the-sun-go sentiment is the same). So when my boyfriend suggested we draw upon his Swedish heritage and host a midsommar party, I was game (and it seemed only fair, given the number of epically large Seders and latkesplash parties I'd forced him to co-host). I was surprised and delighted to discover how easy it is to have an American midsommar, and how much fun. Plus, what other holiday gives you an excuse to wear a flower crown when you've grown beyond flower-girl age? Swedish midsommar essentially comes down to three things: friends, food and schnapps. New potatoes and strawberries are just coming to harvest at midsommar, and a Swedish party wouldn't be complete without them. Usually the berries are served fairly unadorned, save for some lightly sweetened whipped cream. New potatoes are showcased in a similarly pared-down fashion, usually with just a touch of butter and dill (the only fresh herb Scandinavia seems to embrace). Herring, pickled in a simple vinegar or mustard sauce, is also required (although we have gone to the trouble of grilling West Coast sardines for our American celebrations, usually we just pick up a few jars of herring at Ikea for those who are brave enough to try it). 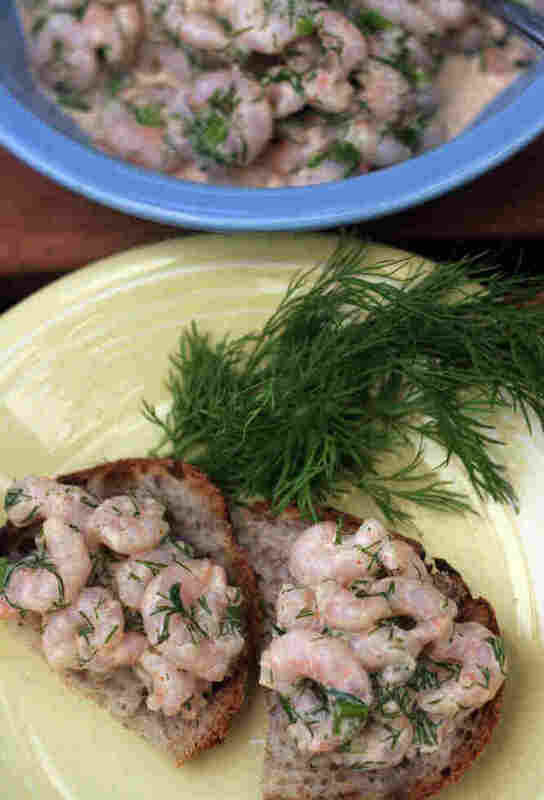 Piles of brown bread or crispbread make a perfect landing pad for heaps of dilled shrimp salad, or thin slices of strong cheese. And then there's the schnapps. No true Swedish midsommar celebration is complete without aquavit (and lots of it). Like gin, this distilled liquor is flavored with a varying blend of spices, from cardamom to fennel to dill, with each distillery (or kitchen) coming up with its own signature combination. But whatever the individual breakdown, the flavor of caraway is usually front and center — which can be a lot to handle in a beverage. Swedes throw back shot after shot of the stuff during midsommar (newbies are advised to only drink half the shot to make it through the long evening), but American palates are seldom up to the task. We first bought a bottle of aquavit years ago to ring in a Swedish-style Christmas (yes, they drink it then as well), and still had half the bottle when summer rolled around — which led to the development of our signature midsommar drink: the Scandipolitan. 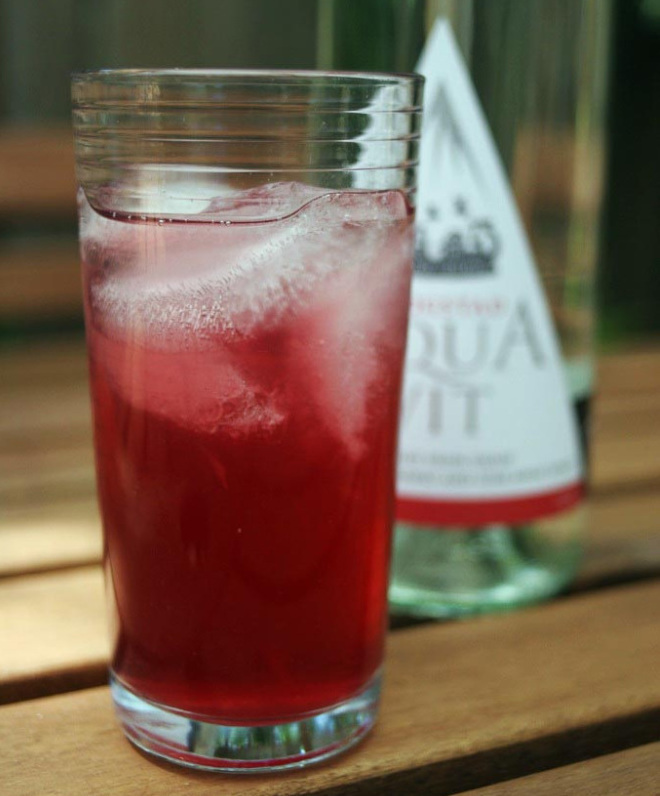 Swap aquavit for the vodka in your standard Cosmo, and then replace the cranberry cocktail with the much-more-thematic lingonberry juice. Even after we found a Portland-made aquavit that is tasty enough to drink straight, the Scandopolitan still has a solid place on the midsommar table. Unlike the Swedes, we mainland Americans still have a sunset on midsommar, though we try to combat it with a large backyard fire. We encourage friends to bring a European beverage of their own choosing, and try to rouse the backyard in song (with limited success). It all creates a lovely, warm summer feeling — enough to keep spirits sunny through whatever dark days lie ahead. 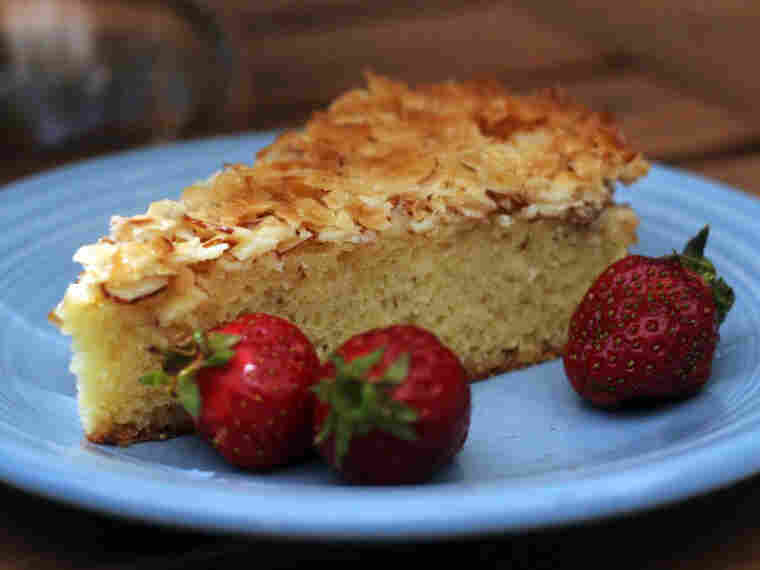 Tosca cake is a Scandinavian favorite, thought to be named for Puccini's opera. It's a delicate sponge, crowned with a caramelized almond, praline-like topping. It's luscious enough on its own, but it also makes a great accompaniment for a pile of tiny new summer strawberries. Preheat oven to 350 degrees, and butter and flour a 9-inch springform pan. Line the bottom of the pan with a circle of parchment, and butter that as well. Sift together the flour, baking powder and salt. Set aside. Mix together the butter, vanilla and milk, and set aside (it should be warm enough that the butter is liquid, but not too hot). With an electric mixer, beat together the eggs and sugar on a high speed until pale and thick. Add the flour mixture and the milk mixture in turns, mixing after each addition until just barely combined, ending with the dry ingredients. Do not overmix (it's better to err on the side of undermixing to ensure a tender cake). Pour into the springform pan and place in the oven to bake for 20 to 25 minutes, until the top is just barely set. While the cake is baking, prepare the topping. Combine the butter, sugar, cream, flour and salt in a saucepan. Place over a medium-high flame and stir to combine as the butter melts. When the mixture has combined, add the almonds and allow the mixture to come to a simmer. Let simmer 1 minute, then turn off the heat. Stir in the extracts and set aside. When the cake has baked for 20 to 25 minutes and is just barely set, gently remove it from the oven. Raise the oven temperature to 400. Gently spread the topping on the cake. Place the cake back in the oven, and bake an additional 15 minutes or so, until the topping is golden brown. Allow to cool before slicing. 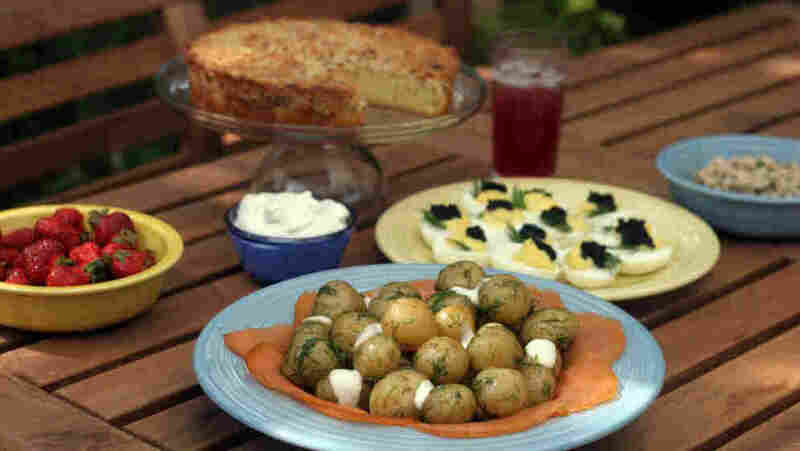 Swedish new potatoes are served quite simply, with just a pat of melted butter and sprinkling of salt and fresh dill. 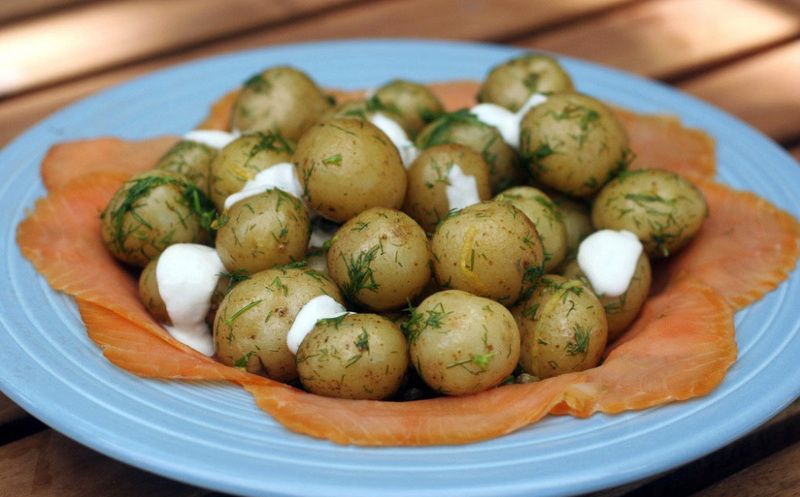 To dress this up for party fare, I adapted a recipe from Jamie Oliver's Jamie at Home (Hyperion 2008), placing the dilled potatoes (with a bit of lemon and capers to spark them up) on a bed of beloved-in-Sweden-and-America smoked salmon (or if you prefer, the more Swedish cold-cured gravlax), and dressing the whole thing with a creamy horseradish sauce. Scrub the potatoes, and halve any that are large. Place them in a pot of salted water, bring to a boil, and reduce the heat and simmer until the potatoes are tender, about 15 minutes. While the potatoes are cooking, mix together the lemon juice and zest, olive oil, vinegar and capers in a large bowl. Add salt and pepper to taste. When the potatoes are tender, drain them, then add them to the bowl of dressing ingredients while still warm. Let cool in the dressing, tossing occasionally to ensure all of the potatoes absorb the flavorings. This can be done the night before, if desired. When the potatoes are cool, add the fresh dill and mix well. Pile the salmon on a serving plate, and mound the potatoes on top of it. In a small dish, whisk together the mayonnaise or creme fraiche, lemon juice and horseradish. Pour a few blobs of this sauce over the potatoes, and serve. This drink is an unapologetic knockoff of a Cosmopolitan, but with a Swedish twist. You can find lingonberry juice at European stores (or Ikea), but in a pinch you can substitute a strong cranberry juice. Pour all ingredients into a cocktail shaker with ice, and shake to mix and chill. Strain into two cocktail glasses, with ice, and serve. What distinguishes this shrimp salad from others is a pinch of white pepper, paprika and heaps of fresh dill. You can serve this on crisp bread, thin sliced dark bread or toast, or as a filling for deviled eggs. You can also Scando it up even further by topping it with caviar (Swedes favor the relatively inexpensive roe from bleak or lumpfish, but you can use whatever you like). Mix together all of the ingredients, and taste to adjust seasonings.